This cope pattern provides you with a pattern and instructions to make a fully lined cope with an ornamental hood. A cope is a liturgical vestment that can be worn by any rank of the clergy, including occasionally lay ministers. It is a long cloak that is open in the front and fastened at the breast with a clasp. If a bishop wears a cloak, he also wears a mitre with it. You can find a mitre pattern here. The cope can be made in any liturgical color, including purple, green, white, gold, and black. The choice of color typically follows the liturgical calendar. Using this pattern, you can make a cope out of either silk, or any other vestment fabric. You can find vestment fabric here. In addition to this pattern, you will also need four yards of 60 inch wide vestment fabric and four yards of 60 inch wide satin. You will also need four yards of banding or other religious trim and a clasp. Any rank of the clergy can wear a cope, including lay ministers in certain circumstances. A bishop who wears a cope usually wears a mitre along with it. 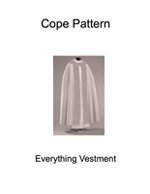 The word cope comes from the Latin word cappa which means raincoat or cape. It originally had a hood, although the hood is now ornamental and sometimes left off altogether. The first mention of a cappa or cope is from a letter written in 787 A.D., and the monks frequently wore copes. In the Roman Catholic Church, all ranks of the clergy can wear the cope during processions, but the priest and his sacred ministers never wear the cope when celebrating the Mass.